In the movie “Being There,” Peter Sellers — in his last cinema role — played Chance the gardener, whose simplemindedness was mistaken for profound wisdom taken to run world affairs. 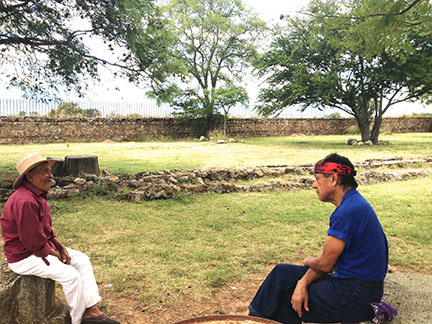 This Sunday in Cuilápam, it was Tomás Ángel the gardener laying down some serious history on the 16th century monastery 30 miles out of Oaxaca City. It had already been a good Sunday, with an early trip to the Tlacolula market, about 30 miles the other direction (eastern valley side) of the city. Tlacolula – and you really do say the “t” and “l” together – has the largest Sunday tiangüis, or open market, in all of meso-America. 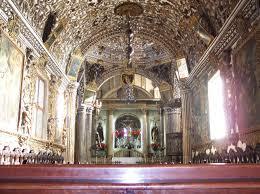 José and I had wanted to catch mass in la Capilla de Nuestro Señor de Tlacolula, the 16th-century chapel that’s been recently restored to gilded glory, though waiting on public transportation put us late in arriving. 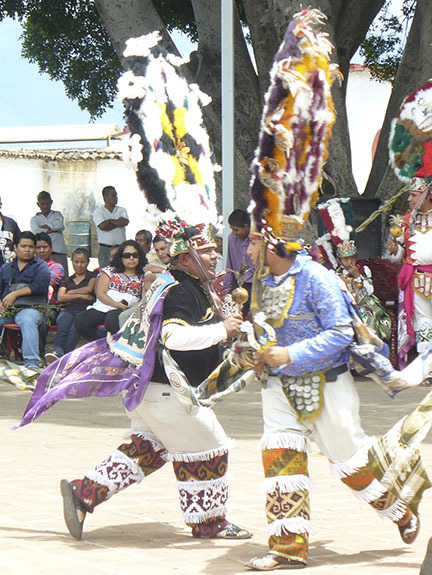 Amazingly, as happens in Mexico when the magic unfolds as it always does, it was a special mass for the town’s namesake saint and the Danzantes de la Pluma (the feather dancers who dance the story of the conquest of Mexico) from neighboring Teotitlán del Valle were doing a sacred version at the altar. Not sure what the conquistadors had to do with Our Señor of Tlacolula, but the chapel and adjoining church were packed and it was lovely. 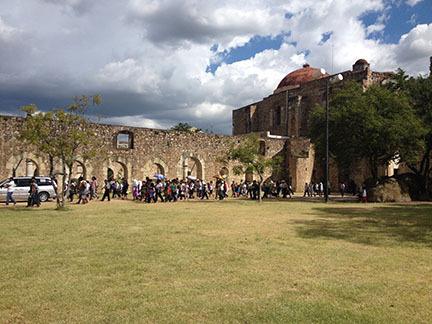 Once mass was over, we headed outside for a breakfast picnic – we’d brought our own thermos of coffee, toast and peanut butter, and bought some verde and chépil tamales from a nearby vendor. 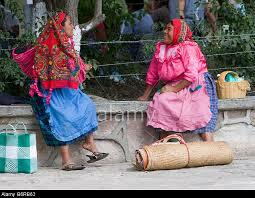 We were gently chided by a pair of sombrero-wearing campesinos who wondered why we hadn’t taken advantage of the free food around the corner, and openly stared at by a pair of brightly clothed Zapotec women who finally commented shyly on our pretty stainless steel thermos and the American tea towel we were using as a tablecloth. Tlacolula’s market surrounds the church on all sides in rows of streets, with a jaw-dropping display of goods from hand-woven straw baskets sold on blankets on the ground to food, clothing, tools, leather goods and just about everything else you can imagine. The inside market has food booths from tortilla and tlayudas (another “tl” combo) to goat testicle tacos, which José dearly loves. I seriously will eat almost anything, but that’s not one of them. We did buy some nice raw tasajo, thinly sliced beef, to grill on the open charcoal grills in the middle of the meat market with green onions, scooped up with fresh tortillas and a layer of lime and avocado. There were stalls to buy harnesses, wooden saddles, ox yokes, market baskets, locally woven wool and cotton goods, tools, electrical accessories from plug converters to USB chargers, antique cast-iron irons and skeleton keys, beaded jewelry, cheap plastic trinkets and a whole slew of ordinary household items from buckets to potscrubbers and nesting sets of pots. 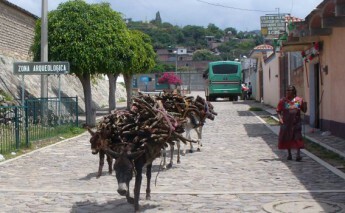 That was the first half of Sunday; we walked right up to the direct bus leaving for Oaxaca at noon for 14 pesos, about 85 cents each. Then because it was such a pretty day – sunny and in the mid-70s, or about 24 degrees centigrade — we decided to take the Bruja out for a spin. She’s a Honda 450 Rebel, with her official name “Black Magic Woman” painted on the back and a set of longhorns on the handlebars. Quite the ride. I didn’t even ask where we were going, and we did battle a fair amount of Sunday traffic before emerging on the south side of the city on the old highway to Zaachiila. 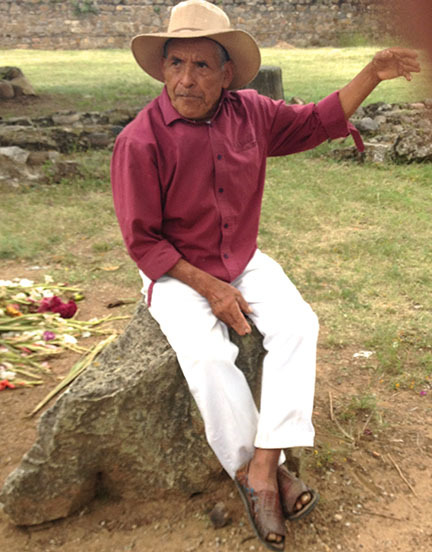 The sky had grown overcast as we parked the Bruja and walked into the walled monastery of Cuilápam, sitting down on a huge rock under a shade tree just as the funeral procession emerged from the church. The mourners walked behind the casket carried by a minivan with the hatchback open, singing and carrying white lilies. As we sat there, a man in white pants, burgundy shirt, straw hat and huaraches came to sit beside us. His name was Tomás Ángel, he said, and after brief introductions all around, he began talking with the slow, clear enunciation of a practiced tour guide. He told us he’d been a gardener at this archeological site for 25 years, though most recently had been promoted to work in the front office selling tickets to enter the museum/ monastery. And if Wikipedia is to be believed (since I later googled the history to see just how accurate his version was), his historical facts were spot-on. At the time of the Spanish conquest, Cuilápam – also sometimes spelled with an “n” at the end, variations from the original Nahuatl suffix meaning either “place of” or “valley of” — was a huge multi-ethnic political, economic and cultural center of Zapotecs, Mixtecs and Aztecs. The origin of its name is debated to mean “the water behind,” “the dirty place,” or “at the foot of the mountain,” sitting as it is in a broad valley lined with dark peaks. 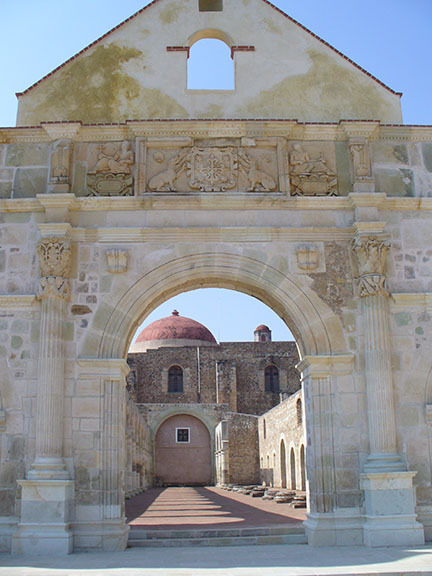 The Dominicans had already moved in to evangelize the indigenous, and began building this massive monastery in the 1550’s. Tomás Ángel got pretty wrapped up in the machinations of that ever-present conquistador Hernán Cortés and I have to admit my mind wandered a little as he went over the intricate inheritance rights of citizens of the Spanish crown, though I did catch that a bequest of four villas to Cortés had turned into two once the Crown took its share (like the politicians of today, said T.A. in disgust). 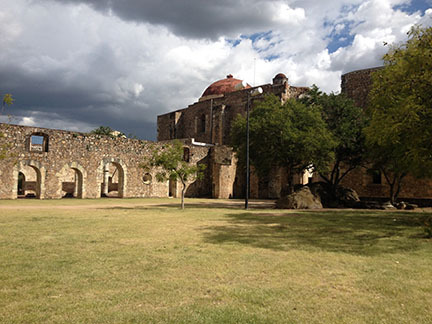 Apparently there was a golden period when Cuilápam had more than 40,000 people and all kinds of sovereignty disputes, then a period of decline in which the monastery was never finished, and by 1600 there was only a remnant population of about 7,000. All of this was told solemnly by T.A. to a head-nodding José as they sat on the rocks like Plato and pupil, José interjecting a few questions here and there about the Spanish form of rule, the locations of some of the nearby towns, and the route of water from the mountains that came into the monastery by way of in-ground stone-lined canals. 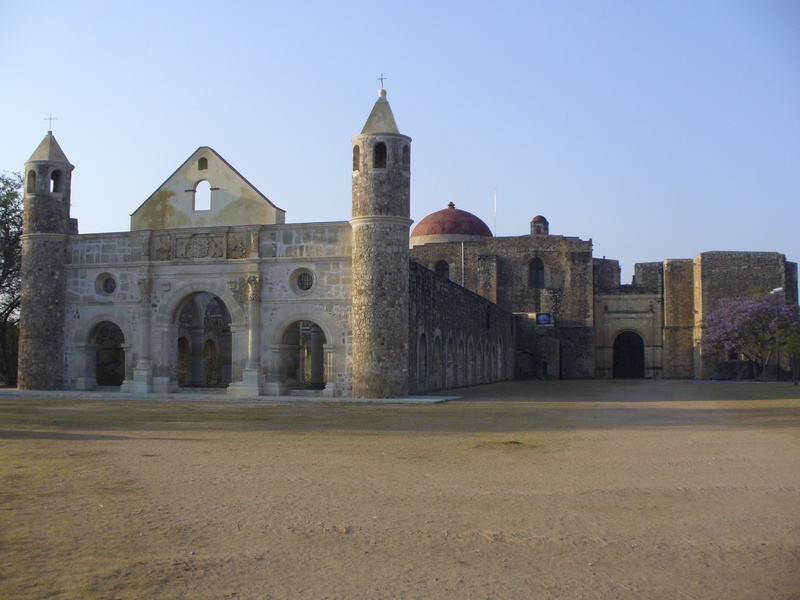 Cuilápam had a relatively silent few hundred years with its unfinished chapel roof until revolutionary general Vicente Guerrero was executed against its walls in 1831, just two years after becoming Mexico’s second president, accused of treason by revolting soldiers. Pope John Paul II visited the site in 1979. 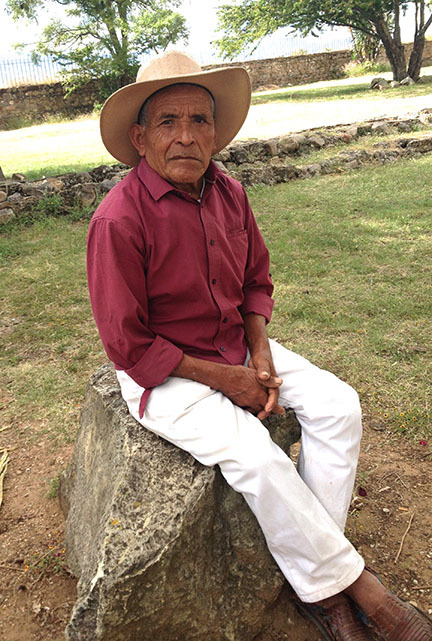 As a few spatters of rain – the last in the rainy season here that’s over almost to the minute of October 15 every year – began to fall, we thanked Tómas Ángel for his company and historical review, and hurried to get back on the Bruja for the 45-minute ride back to Oaxaca. The magic being what it was, the rain didn’t materialize after all and the traffic was even lighter going back to the city. Tómas Ángel the former gardener had been a big part of that magic. And it was good being there. Love the story and the photos. Is the monastery still used as a church? for funerals, weddings, etc?